Throughout the history of literature and other artistic mediums, the concept of "losing everything to understand anything" has been addressed in countless fashions. Medieval literature dating back as far as "The Canterbury Tales" and "Everyman" incorporates this ideal, while classic and modern cinema like Sidney Lumet's 12 Angry Men, David Fincher's Fight Club, and even TV's "Lost" close in on similar ideals with broad tonal differences. 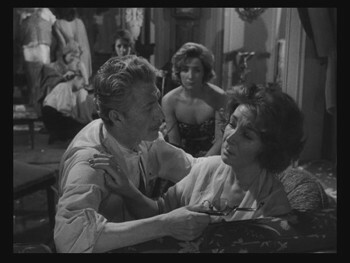 But with Luis Buñuel's The Exterminating Angel, arguable the Spanish/Mexican auteur's most challenging work, this concept is taken to a completely different level. He not only illustrates it through a socially relevant portrait, but also emphasizes the complexity of the human spectrum through a large group of people who grudgingly endure this transformation. Buñuel's self-written and directed critique is a fascinating blend of spiritual fantasy and class deconstruction, one that stretches its evocative nature well beyond the claustrophobic confines of its ingenious setting. The Exterminating Angel's plot is deceptively simple: after an upscale dinner party filled with snooty, criticism-laced banter, a large group of socialites adjourn to a sitting room for after-meal conversation and music. They continue their bold-faced projections of self worth amid their banter, trying to hold up their distinguished theatrics for the sake of social stature as the night grows older. Finally, in the wee hours of the morning, some of them have the urge to leave -- but can't, both through happenstance desires to stay and a physically nauseating sensation when they attempt to force themselves out. Instead the guests continue their conversations, find strategic points in the room, and inexplicably drift off to sleep without the consent of the party's host and hostess. Believed to be an aggressive and intentional faux pas, they indulge their guests for the sake of saving face; but as the morning comes and the sensations continue, they all begin to realize that there's an aggressive, supernatural force at play that aims to corner them in this situation until an undetermined point and time. Little did they know that this room would quickly turn into something of a celestially-imposed intervention site, a space deemed fit for Darwinism and close-quartered social collapse to take place. As their pompous façades strip away and their hungry bodies begin to smell from a lack of opportunity to keep up hygiene, their raw personalities begin to surface. At that point, The Exterminating Angel turns into both an entrenching analysis on the maddening nature of hopelessness and an enlightening exercise in self-identification. The prospect couldn't be more streamlined: trap a group of misguided social people into a confined location and let them fend for themselves without food, water, or the plumpness of their wealth. By keeping the focus on a single group of vagabond-like people in an awkwardly-shaped room, it places strong emphasis on the unappreciated nature of the world outside its walls. This controlled setting also keeps The Exterminating Angel's behavior at a remarkably convincing level, almost positioning us as a literal fly on the wall as we witness this phenomenon. In the same vein as Lumet's fantastic 12 Angry Men, Buñuel makes the most of this claustrophobic scenario by creating a miniature war among typecasts once the hardened layer of societal importance washes off the characters. Some don't take kindly to this environment, like the selfish "profiteer" brother who intends on hording resources, while others attempt to roll with the punches and try to figure out the reason behind their invisible imprisonment. Most of them, however, seem intent on finger-pointing, which opens a door for The Exterminating Angel's stance on the dangers of misguided mob mentality. Human nature's infectious sheep-mindedness is attacked vigorously in this pitch-black satire, once actual human beings come out of the woodwork. And, as the film progresses, it becomes obvious that their true selves thrive upon a sheep-eat-sheep state of mind -- both in literal and figurative senses. Specific character mannerisms are still important in Buñuel's film, but more for the negative energy that they generate than the positive. As it stands, this situation quickly evolves into a weeding-out process -- almost like a large-scale Petri dish -- to show what can and can't survive under the harshness of society's desperation. Within this erratic environment, a pair of shy, seemingly taboo lovers struggle with the unique situation of searching for quiet corners to lie and love, while others must try and endure the maddening effects of hallucination and hysteria in a growingly volatile environment. Some of them heighten their aggressiveness, while others become more recessive -- elements of the dominance structure in nature. The Exterminating Angel escalates into a surprisingly primal film, one that strips away long-slaved-over illusions of class and vanity from its focal subjects to show a portrait of what two-faced socialites resort to in the direst of situations. Theories and ideas are one thing, but putting them into action in a manner that truly affects its audience is another. Buñuel, through delicately-scattered surrealist images and a top-notch script, executes The Exterminating Angel with pitch-perfect, mesmeric tones. He crafts his ambitious-yet-simple picture into a meditative parable, one chock full of cunning imagery that ties together a wide gradient of beliefs and impressions. But, though straightforward in design, it's as complex and thematically rich as the viewer wills it to be. Sheep share boundless significance, painkillers become a symbolic commodity, and even the ravings of an elderly, dying man serve as a bold foreshadowing mechanism that only completely reveals itself much later on. He claims that he's glad he won't witness the "extermination", which instantly causes us to think of Buñuel's title, think of the situation, and size up both for cinematic puzzle-solving. The Exterminating Angel is endlessly fascinating due to its labyrinthine concepts, but it's also an enigma compelling enough to spark actual desire to witness the material many times over. Buñuel knows how to have fun with its singularly-focused locale -- much like Alfred Hitchcock's Rope -- while also keeping the weight of their banter lively and pertinent. He also comes together with regular cinematographer Gabriel Figueroa to photograph the film in a way that keeps our eyes yearning for exposition, causing our glances to dart every which way about the room for any extra clues regarding the force's mystery. Within its architecture are the numerous "prisoners", all of which are played with precision and charisma by a broad range of actors -- most notably being Buñuel mainstays Silvia Pinal (Viridiana) as the "Valkyrie" Leticia and Claudio Brook (Simon of the Desert) as the steward. 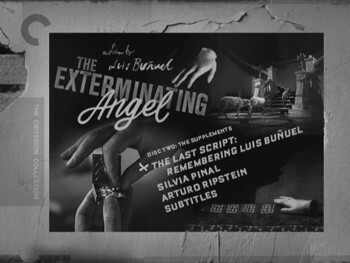 But it's hard to single out any of the cinematic elements within The Exterminating Angel, essentially because they all seamlessly come together to focus on Buñuel's core material. What they result in is an astoundingly complete mystery that will linger with you for days, one that somehow brings spiritual and societal concepts together for a mammoth of a thought-provoking masterpiece. 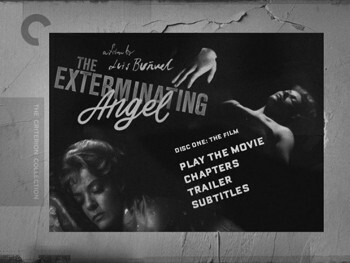 Criterion's two-disc package for The Exterminating Angel comes in a clear, layered Scanavo case, revealing internal artwork that completes the presentation's black-and-white color scheme. Inside is a sizable booklet that contains two textual articles: one being a warm and insightful Essay from Marsha Kinder, and the other a 1970 Q&A with Luis Buñuel about the film. Both are excellent reads, offering enough explanation about the film to (nearly) take place of an audio commentary. The Exterminating Angel is Criterion Spine # 459. 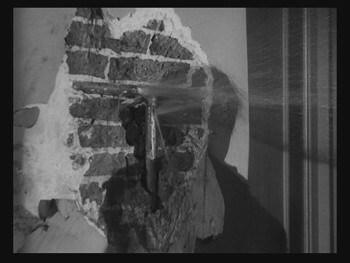 Let's get two points quickly out of the way: The Exterminating Angel, presented in its original 1.33:1 aspect ratio by way of a 35mm duplicate negative on a Spirit Datacine, is mildly windowboxed, and it shows some evidence of line damage at several moments throughout the film. 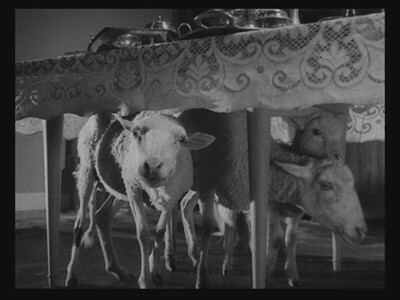 With that said, Buñuel's film looks marvelous. The gorgeous claustrophobic black-and-white cinematography displays strong dimensionality, as well as incredible contrast levels that anchor on deep inky blacks and robust monochrome mid-levels. The amount of detail here can tack you aback -- it shows off lace and wool textures with exquisite strength, all the while flowing gracefully in circles with Figueroa'a cinematography with distinguished and distortion-free movement. Film grain meshes beautifully with the digital elements of the transfer, giving it a distinctive cinematic feel that pumps life into the experience. From start to finish, it's an impressive grayscale image with negligible damage. Fighting to keep speed with the excellent transfer, the Spanish Mono track does a solid job at keeping vocal strength extremely crisp. It has a distinctive hiss that coats the audio track for a sizable portion in the center of the film, but it never reaches dangerously distracting levels. Small sound effects, like the flipping of a switch or a bear's wail, sound excellent, while harsh thuds against a wall push the barriers of the track with minimal distortion. Plus, as per Criterion's regular effort, the English subtitles are exquisitely fluid -- only showing one or two instances of a missing word. The English subtitles are optional, but they are the only track available to accompany the Spanish language option. A lengthy, non-anamorphic documentary, this piece follows fellow Buñuel corroborator Jean-Claude Carrière and Buñuel's son, director Juan Luis Buñuel. They take a casual stroll through many locations that bring back fond memories of the director, all the while keeping the material in chronological fashion with his filmography's history. Slices of footage from his films are wedged into their content, all the while keeping a deliberate pace with vibrant Mexican music. The most intriguing bits, of course, are the numerous timely reflections that the pair pull out about Luis Buñuel's experience with making his films, hallmarked by casual interview times with other colleagues. Discussions range from his work with cinematographer Figueroa and his experience at Cannes, to the place where Carrière and Buñuel started their career together. The feature is segmented into fourteen chapters, mostly labeled by the locations in which the memories are focused. New, segmented interview footage is available here with Buñuel's starlet Pinal and pseudo-protege Ripstein. Pinal discusses her stabs at trying to make sense of the material, along with giving glimpses into Buñuel's methodology and half-sensical explanations for the scenes that he's filming. Ripstein, however, gets more personal and in-depth by explaining the process in which he became Buñuel's assistant director on the film. Both are very heartfelt and pleasing to watch, giving intimate glances into the director's mannerisms and techniques. A Trailer is also available on Disc One, which looks nearly as good as the film presentation itself. It's a strong lead-in, one that doesn't give away too much of the imagery or too many plot twists. 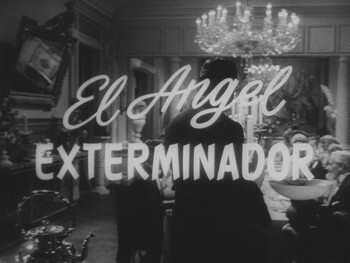 Luis Buñuel's The Exterminating Angel is a high-concept, low-scale dismantling of class structure by way of a divinity-based premise, one that lowers the denizens of metropolitan society dangerously close to primitive levels. It's richly saturated with symbolism and thematic prose, while also maintaining a dark satirical tone that stays so pitch-black that it barely sneaks in any semblance of humor. But it's there, amid all the fuming arguments and embittered, starving schemes, while the clock ticks away either towards their demise or a crucial awakening. Surreal and utterly gripping, it's one of Buñuel's best -- and a tour de force in its own right. Criterion's two disc edition of The Exterminating Angel might not seem loaded based on the numbers, but the level of content available in this package delivers a quality supplemental experience with the film. Matched with an immensely refined transfer and splendid subtitles, this is an impressive offering for an important and enthralling piece of Buñuel's catalog. For the film's physical presentation, the solid supplements, and the availability to view this infinitely engaging picture, The Exterminating Angel finds its way into DVDTalk's Collector Series.